AMMONNEWS - Minister of Foreign Affairs and Expatriates Ayman Safadi and his Russian counterpart Sergei Lavrov on Tuesday discussed on the phone the latest efforts to find a solution to the Syrian crisis based on Security Council Resolution 2254 that preserves the country's unity, and that is accepted by Syrians. The ministers said the international community should step up efforts to reinvigorate the political process and launch the constitutional committee's work as a key step in the process. Safadi and Lavrov also discussed the issue of Syrian refugees gathered at al Rukban camp inside Syria, and agreed on the need for their return to their towns and villages, as a drastic solution to their plight, and on Jordanian-Russian-US coordination to address the issue. They also spoke of the need to support the efforts of the new United Nations envoy to Syria, and said they look forward to cooperating with him to reach a political solution to the crisis as soon as possible. Safadi stressed the importance of a robust Arab role in the efforts to end the Syrian crisis as a priority and to reach a political solution, that restores the country's stability and its role as a major player in region stability and joint Arab action, and to create the right conditions for the return of Syrian refugees. The ministers stressed the importance of joint coordination in efforts to resolve the Syrian crisis and consolidate stability in southern Syria. Safadi said Russia had a key role in the political process to resolve the Syrian crisis. 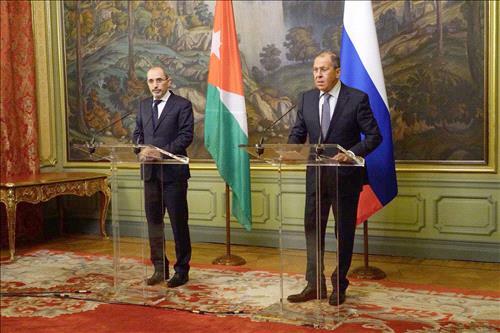 Lavrov commended Jordan's role in achieving regional security and stability. The ministers also discussed the Palestinian-Israeli conflict, where the two-state solution according to international legitimacy resolutions and the Arab Peace Initiative is the only avenue to bring about comprehensive peace in the region.